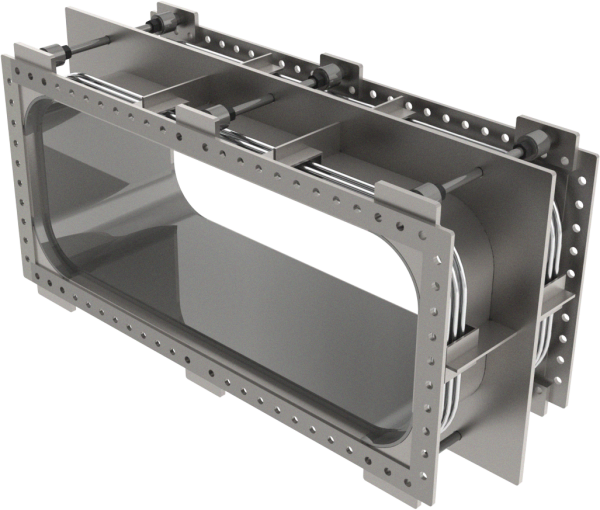 Bellows may be attached or linked to angle or plate flanges, or duct sections. One or two rectangular flow area metal bellows, each with 1 or more convolutions. Typical dimensions of 12” x 12” minimum, up to 240” square. Overall length may vary, typically within the range of 12” to 100”. Convolutions are U shaped or V shaped. Additional accessories may be incorporated such as load bearing restraints, movement limiters, protection devices. Absorbs ducting thermal movement, primarily axial but may include small lateral and/or angular movements. Movement amplitude varies, typically within the range of 1/8” to 8”.